Ted van Rijn lived in Tchad overseeing the design and build of a new Heineken plant at Moundou in 1965. There he ran this Citroen 2cv, 0390 A 07 – the 390 th. registration in the province 07 – Eastern Louoma. 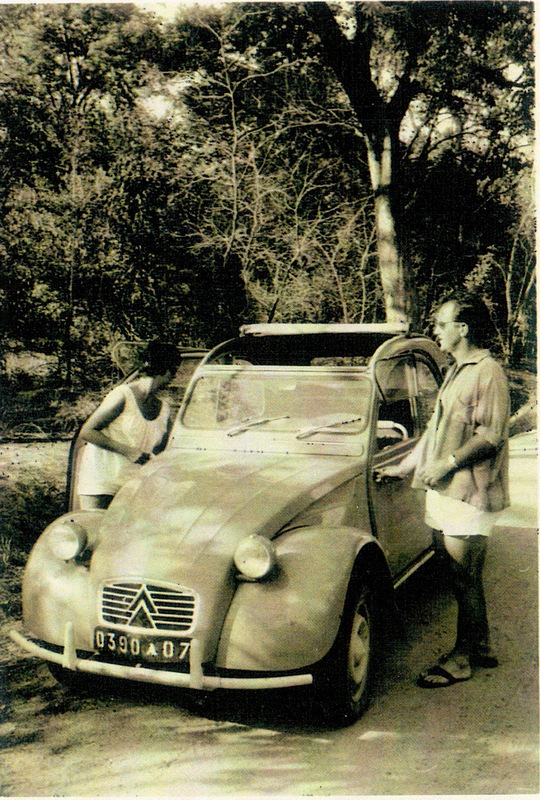 There were no roads and the Citroen was the ideal vehicle for the terrain. Chad had been independent from France since 1960, when it had formed part of French Equatorial Africa. As usual in French Africa, numberplates were made up with stencils and white or silver paint, often in this characteristic font. This entry was posted on Friday, March 23rd, 2012 at 12:22 pm and is filed under Africa, Historic, Tchad. You can follow any responses to this entry through the RSS 2.0 feed. You can leave a response, or trackback from your own site. A valuable photo from the archives! I wonder if Ted is still with us? He sure is still extant! I met him on the ship Marco Polo in the Cape Verdes in January 2012, cruising to Manaus. He told me that he had built beer factories all over the world, but it was when he mentioned the Chadian period, I seized the opportunity to importune him for a photo of his car there. As good as his word, Ted’s envelope dropped on to my doormat this very morning.